5 Min Brass Sand timer with wooden Brass Stand. Material : Brass, Glass sand. - Size: Height -3.5 inches (9 cm) and 3 inches glass diameter. We are looking for the export queries majorly from USA, UK, Canada, UAE, Russia, Brazil, Australia. 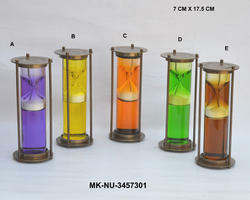 Our Sand Timer are made of high quality brass and glass. The theme is Nautical Antiques. Fine Timer with compass, made by brass. We are wholesaler & exporter of camping handicraft. With immense market knowledge, we have been able to provide optimum quality Sand Timer. 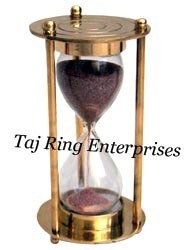 We offer our clients the qualitative range of Brass Sand Timer with Pink Sand. The offered timers are available in different specifications. Maharana company Antique Brass Timer, Size/dimension: 8"
Item Code:-KE-ST07 These timers are widely used to measureshort time period, as these allow to pass sand from the upper to the lower glass sphere.